The 2011 NBA draft is over, but instead of talking about draft grades that you can find anywhere on the Internet, I want to focus on historical patterns and why this past draft was a train wreck in terms of execution and scouting ideology. The first 6 picks rolled through with a mild surprise in Tristan Thompson who surged to number 4, and Brandon Knight who dropped out of the top 5 despite several NBA Draft prognosticators labeling him the number 3 pick. Utah wisely chooses Enes Kanter while Knight's fall lasted until Detroit scooped him with the 8th pick. What happened next not only left me scratching my head, but made me question if scouting had really been done. Bismack Biyombo has been glorified as a Ben Wallace clone since dominating 2011 Hoop Summit with a triple double showing. He also has some unique circumstances that almost mirror rising NBA player and Congo native, Serge Ibaka. Charlotte committed hard and drafted Biymombo early at 7. After all, how could they not be getting something similar to Ibaka? The big picture though has become clouded and even though both players have alarming similarities, they quickly stop after the heritage and Junior Spain basketball upbringing. Unlike Biyombo, Ibaka at 16 had a much more refined game with solid perimeter shooting, ball handling and is a much more explosive player. In basic basketball Jargon, at 16-years-old, Ibaka's fundamentals were light years away from 18-year-old Biyombo's. Even when you look at their work in the LEB (Spain's second division Basketball League), Ibaka trumps Biyombo in every category. It amazes me that the NBA doesn't draft high schoolers because they claim that extra year of school is good for them (maybe two, depending on how this year's Collective Bargaining Agreement shapes up), but upon seeing Biyombo's triple double assault on USA's Junior National team, NBA GM's decided he has the goods. Never mind that the US had no true center. Heck, I could even argue they had no true power forward, as UNC bound James McAdoo is a combo forward and Kentucky Bound Anthony Davis is a mere 195 pound forward who is still getting his body together after his astronomical 8-inch growth spurt after his sophomore year. These guys are hardly NBA bangers but yet some acted shocked on how Biyombo dominated them physically. The point is, he isn't a sure thing and has more questions surrounding him than any player drafted in the top 10. 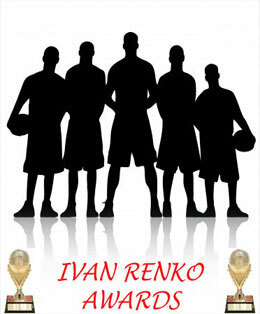 With the 2010 NBA Draft now a thing of the past, history books are beginning to reveal something interesting; I dare to even call it alarming, and it may prove to be a budding new trend: the international basketball market is in severe decline. Take a look at this past 2010 NBA draft. There was only one international draft pick in the first round, Kevin Seraphin. And after Seraphin suffered a minor knee injury, it was rumored that he might withdraw from the draft. 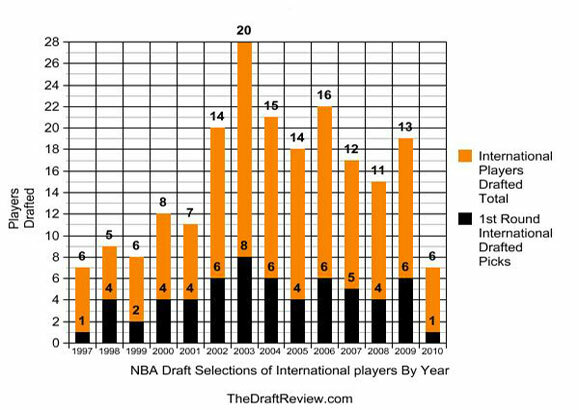 That would have meant no international draft picks in the first round, a scenario that hasn’t occurred since the 1997 NBA Draft. As for round two, there were only five foreign picks. So why was Seraphin the only international first rounder? When Donatas Motiejunas and Jan Vesely both pulled out of early entry, no doubt the international market took a hit. Most early entries withdraw from the draft because of poor draft status, but this was not the case with Motiejunas and Vesley. Although both prospects were projected as locks in the first round, there was speculation that contract buyouts could hinder Vesley’s and Motiejunas’s prospects. But even if you factor in these two “no shows”, the numbers still dictate a decline. In a sport dominated by African Americans (82% during the 2008-2009 NBA season), white ball players are dealt an unfair hand each time an analyst limits them in comparison to a historical white player. Comparing white to white only is a flawed method of evaluation. 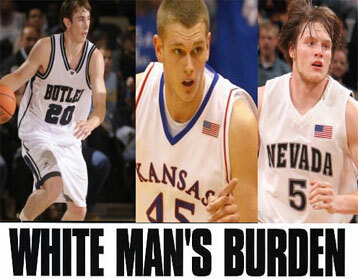 Mathematically speaking, white players should find themselves compared more often to African American ballers. Old habits are hard to kill, but for the sake of basketball’s evolution this must change. For example, take a white player like Gordon Hayward and you get the same old boring cookie cutter analysis: “Average athlete, great feel for the game, blah, blah, blah”. Race is the elephant in the room that many claim does not exist, but when I caught up on some 2010 draft info, I discovered the race card continues to be an ugly factor. Getting back to Hayward, I’ve seen ridiculous comparisons like Luke Jackson, Michael Dunleavy Jr., Troy Murphy and Pat Garrity. The general rule seems to be this: find any white perimeter player and assign the comparison to Hayward. This is a glaring example of how draft history can go beyond lines of nostalgia or entertainment and be utilized in a more purposeful manner - to identify historical players (regardless of race) that best suit the current player rather than drawing straws for players of the same race. Like most things in life the NBA draft does not come without politics, which can sometimes be the driving force behind draft selections that don't add up. And when it comes to a player's pedigree, politics almost always seems to be in the mix. Pedigree is generally defined as "a known line of descent". 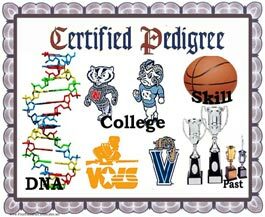 In the basketball world pedigree can translate into the college a player attended, his past accomplishments in high school, or who his parents are. Unfortunately, pedigree appears to boost certain players on draft night and contributes to quality players being selected lower on the board or left totally undrafted.